As always, I trust the taste of the fine folks over at Dirt Cult records almost unconditionally. While I don't buy every single thing they put out, I feel like I pick up an awful lot of their records, and with reason. Especially in the world of catchy punk rock, their tastes line up with mine just fine. 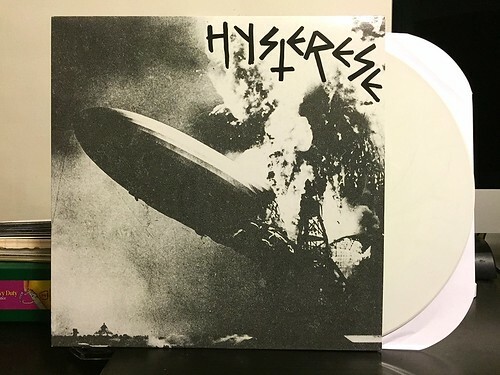 Hysterese is a band from Germany that I hadn't really heard much about, but the description of their record in Dirt Cult's upcoming releases updates had me intrigued, so I decided to grab it. I am so glad I did as this is a real powerhouse of an album. It's an interesting mix of styles as the band manages to incorporate elements of the Marked Men's two thousand mile an hour guitar riff insanity with a more intense tone. If you need another frame of reference, the band that I hear the most similarities to is Sedatives (minus the organ). It's a darker, serious punk album that doesn't shy away from big hooks. The alternating male/female vocals really give the songs a massive impact as the combo creates a huge, powerful sound. Top to bottom this is simply a great record. If you can get into bands like The Estranged, Red Dons or Hot Snakes, this is record that should really be in your collection.